Well, my intention was serious but eh, what can you do? Time to bump this with something I think is quite interesting. We've talked about weapons before in this thread, but what about something a little bigger? Reading through Umezono's reviews of the October CotM nominees, specifically the review of Gordeau by OHMSBY, he mentions how some of Gordeau's hitboxes are 'absolutely enormous', and that's a fair point, so what would you do differently? 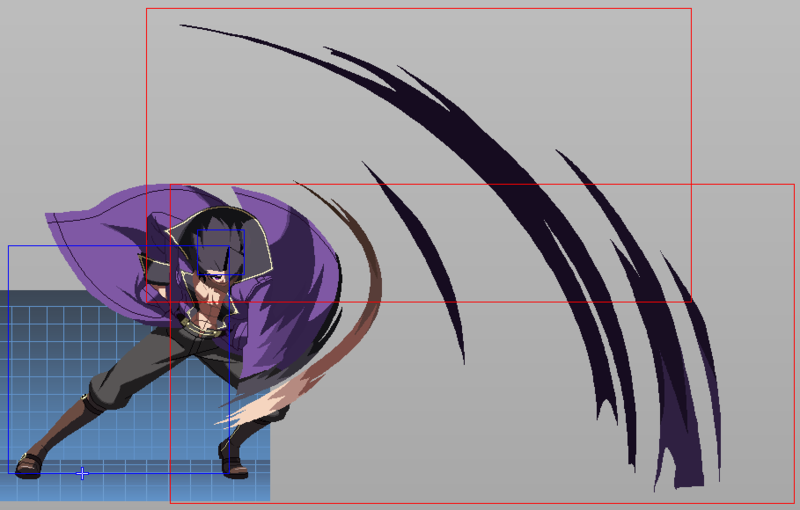 You'll notice the hitboxes are active on a later frame in the UNI version, but since that's the original, that's what I decided to use for the template (plus it's easier to see the weapon's range). Have fun if you want to attempt it (let's get at least a couple of serious ones, hah). 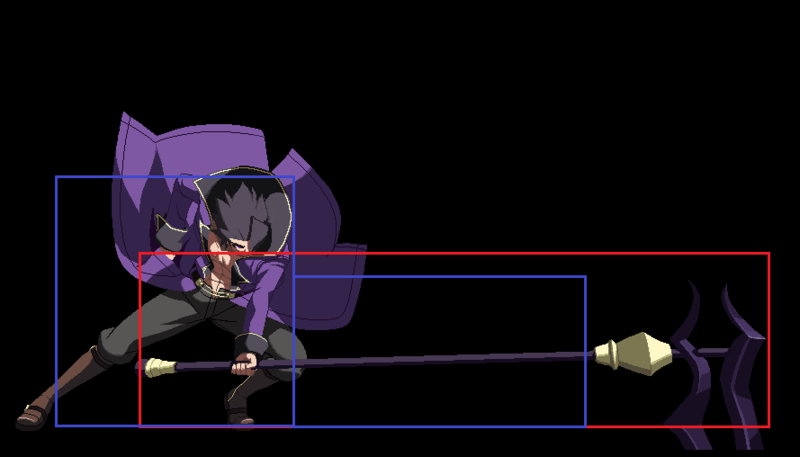 Here's my horrible attempt at hitboxes. Not exactly who or how this character plays. But there'd be a massive delay on recovery to make up for the massive hitbox advantage. 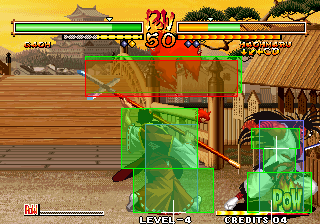 The first hit box frame would last 1 tic. The end hit box would be determined in game and edited down to probably 2 tics, maaaaybe 3. I should have extending his blue boxes to match where his arm first travels in the 1 tic attack frame, but that'd be worked out after a few tests. Yamori X, why would you be able to hit all that open blue above the ax? idk about that blue box on the staff... seems awkward cuz if an attack hits that blue box on the staff, damage will be dealt to the fighter. That's how weapon attack CLSNs usually go for. ya, so they cant just throw out unpunishable hits. kof provides the best example of this. Last Edit: January 14, 2019, 10:49:36 pm by nick. As I've said many times before, even weapon based fighting games know that weapons are to be treated as an extension of the body. Yet there will always be someone who expects realism in a genre where the laws of gravity are horribly warped and regular people throwing fireballs are the norm. 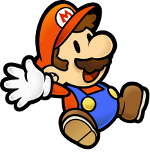 So at what point do we consider large disjoint hitboxes to go from carefully crafted character design to bad design? If the character is designed to control space with large disjoints, couldn't that be considered as part of their kit for zoning purposes? Last I remember Gordy's large disjoints were considered part of his character identity. 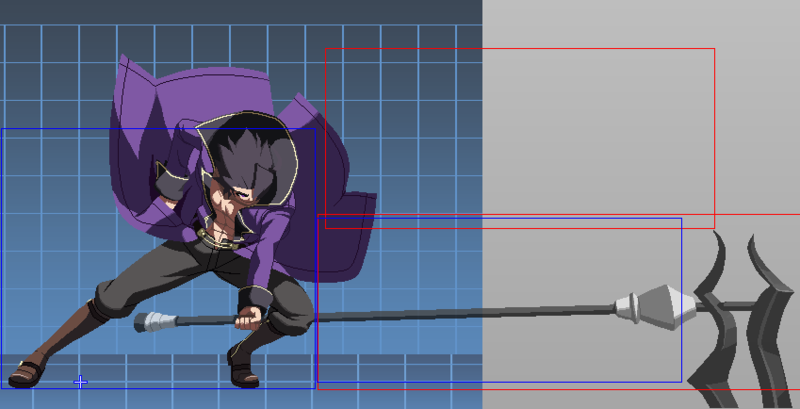 I normally just go with "roughly half the hitbox needs a hurtbox" route because a lot of fighters I play do this with weapon based attacks and it's what I use as a basis for some of my own creations whenever they use melee weapon based attacks. Excessively safe zoning is pretty broken, which is why why gigantic hitboxes that cannot be traded against are usually frowned upon. 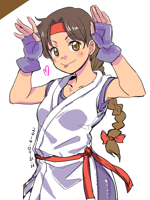 They should still beat out non-reversal based unarmed strikes anyway because they still have more hitbox than them, but something like a Shoryuken that is meant to beat out other attacks should still be able to hit through them as well. Wow cool. Wasn't expecting this many replies. If an attack is going to be long-ranged but slow and punishable, you'd want it to have pretty decent priority during its active frames so it doesn't get beaten out by a jab or a quick poke, and then extend the hurtboxes out for a few of the recovery frames that follow so it can be punished if blocked.